The first signs of greatness were shown from the Little Master at Old Trafford. 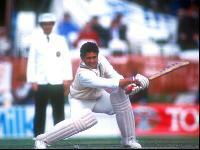 Sachin Tendulkar's first Test match ton helped India gain a draw from a potentially slippery position in the 2nd Test, India vs England in 1990. He made 119 runs in his debut match. His reputation gaining momentum, the young prodigy showed remarkable character as he stamped two hundreds in Sydney. 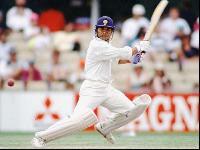 The 3rd Test match ended in a draw even as Sachin scored 148 not out in India vs Australia in 1992. Tendulkar came as a picture of concentration and calm, when most of the batsmen squirmed away from the bouncers and were unable to cope with the extra pace of the Perth wicket. His famous knock of 114 will be remembered as India lost the 5th Test match by 38 runs against Australia in 1992. The pacy Johannesburg track South Africa led by Allan Donald blew away the Indian batting order. All the Indians were ducking, weaving and edging, except Sachin Tendulkar. Out of India's first innings score 227, 111 belonged to Tendulkar. 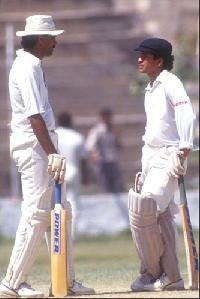 This was India vs South Africa, 2nd Test in 1992. The first Test ton by Sachin on home soil. India piled on a total in excess of 500, which largely came off the bat of Tendulkar's masterful 165 runs. India won by an innings and 22 runs in the 3rd Test vs England in 1993. India set a massive 472-run target against the Lankans as Sachin set an unbeaten century score of 104. 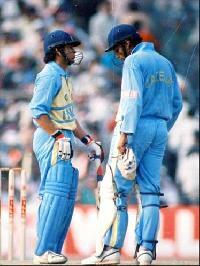 India won the match by 235 runs against Sri Lanka in 1993. Tendulkar and India tormented Sri Lanka as Tendulkar scored a brilliant century. The visitors went down as India won by an Innings and 119 runs in the first test in 1994. Sachin made 142 runs in this match. After 78 ODIs came the ODI knock against Australia which got a hundred, 110 runs innings. Thus followed the many ODI centuries. In the 3rd ODI from the Wills World Series in 1994, New Zealand had piled up a huge total of 269 but it was nowhere to stand infront of Tendulkar's century score of 115. India eventually won the match by 7 wickets. The ODI series against West Indies in 1994, saw India on top with a 4-1 clean sweep. Tendulkar had piled up a century and 2 fifties making him the Man of the Series. The little master scored 105 runs.